Living in Kansas City you are very familiar with the erratic weather we have in Kansas City during the spring and summer months. Over the last 30 years the average wind speed for the Kansas City Metro area is 10.6 miles an hour where the average maximum wind speed is 40 miles per hour. This makes for some sleepless nights concerning our beautiful mature trees. 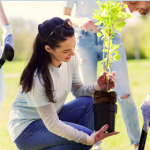 Ninety percent of tree roots exist in the top 18 inches of soil, and ninety percent of those roots exist in the top 4 inches of soil. This means that tree roots are very shallow and the compression plate of a big tree (the structural root plate that bears the weight of the tree is less than 10 percent of the tree’s total roots) may be shocked, causing a top heavy tree to be vulnerable to uprooting. As a tree tugs on roots on one side and presses down on roots on the other side as wind pushes against it. In very wet soil, and if the winds are strong enough, the tree can uproot or fall over. If the tree has other hindering issues they can up root in light or no rain and light winds. To prevent one of your beloved trees from uprooting, there are a few other indicators that determine if your tree is at risk. The first thing is to look at the roots in particular, look for the fruiting structures of decay fungi, such as Ganoderma root rot. Conks, puffballs and mushrooms are also warnings that roots may be shortened or weakened. If decay fungus has been eating away at the tree for years, this can mean that the tree’s root system has been injured and can’t withstand shear and compression pressures of the high winds rolling across the plains. Health and structure are two different concerns. A tree may be healthy, but also may have some hidden structural problem(s) that could lead to a fallen or damaged tree. The tree’s roots may be fine, but a hollow core or decay in limbs could lead to damage in a heavy storm. When examining a tree it is good practice to inspect old pruning cuts and sometimes to even drill into the trunk to look for a hollow or decayed core, this should be done by a professional. 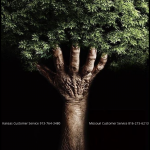 Please contact Tree-Mend-Us Care Tree service today with any questions and to set up your free estimate today.